I was talking to Atmel the other day – they had announced the release of their ATPL230 power line communication (PLC) chip, which was filling in of one of the squares in the strategy that we reported on some months ago. PLC is one of the ways in which smart meters can communicate back with the utility. But when you look at Atmel’s overall communication strategy for smart energy devices, there are other options, including Zigbee, but notably not including WiFi or Bluetooth. This may look simply like yet another battle in the wireless world, but there’s more to the story than that. First, the inclusion of Zigbee has less to do with technology than you might think. In fact, it’s partly a money story – and it almost sounds like a strategy determined by tactical dollars. As Atmel describes it, some years ago, stimulus dollars were available. Without going into the details, putting Zigbee into smart meters was a “future-proofing” step that made those stimulus funds available. Now the Department of Energy recommends (although doesn’t require, since it’s not a safety issue) Zigbee for “smart energy” home use. But the other thing that occurred to me is that “smart energy” and “smart homes,” which would appear to be versions of the same thing, have more nuance in them as well. “Smart” tends to mean “connected,” and the smart home has lots of connected items in it. Thermostats are frequently cited as examples, but so are refrigerators and dryers and door locks. But there are two things going on here. “Smart energy” tends to refer to energy-related devices that communicate on the utility’s network. And they do so via protocols like PLC and Zigbee. The kinds of devices that qualify as “smart energy” obviously include smart meters and other equipment dedicated to the efficient delivery of electrical energy. But utilities also want to be able to reach into homes and factories and tinker with usage to optimize energy consumption when supplies are tight. That clearly means turning down the thermostat, but it could also mean communication with appliances that consume lots of energy, and whose use involves options, like your clothes dryer. Would the utility actually try to reach in and prevent you from drying your clothes when energy use peaks? Perhaps not. Might a dryer manufacturer elect to include a feature that allows the utility to display current electricity pricing in an era of demand-based pricing so that you can decide whether to dry now or later? Possibly. But there’s another aspect of the smart home, and that’s the ability to connect items to the cloud and to smartphones or computers. Yup, the Internet of Things (IoT). This is a completely separate network from the one the utilities use for smart energy. And they tend to use WiFi or Bluetooth Smart because that’s what’s in phones and computers. 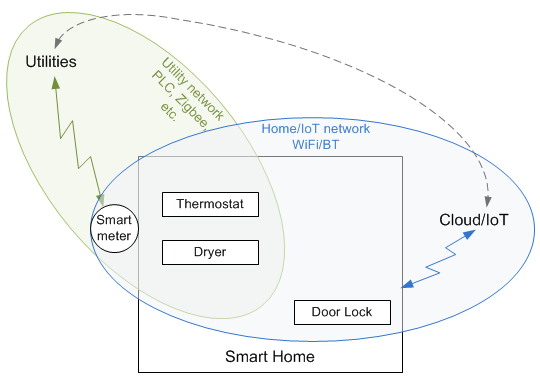 So, in theory, a thermostat following the DoE-recommended approach could communicate with the utility via Zigbee and with the IoT via WiFi. The dryer could communicate via Zigbee to receive electric pricing – or it’s possible – even likely – that the utilities would also place that pricing information in the Cloud, accessed using WiFi. According to Atmel, much of the smart-meter Zigbee capability out there now via is unused within the home. It’s clearly available for connecting outwards towards the utility, but to access nodes inside the home, the meter could also use WiFi or Bluetooth. You could even argue that it would be much more efficient to do it that way, since the smart meter would be the single transition point between the utility network and the home/IoT network. The alternative would be to require numerous devices in the house – thermostats, dryers, anything that may need to talk to the utility – to have both radios so that they can talk both to the utilities and the IoT. All of this is, of course, still in play, so there’s no one “right way” to implement this. And yes, I keep coming back to this wireless question, not so much because I have a preferred “winner,” but because it seems to be a confusing space, and I look for those occasional refreshing moments of clarity.